This outfit has been a long time coming. I made the Archer Button Up before Christmas, and bought the Lark yarn from Quince & Co. at the end of August (geez!). As my skills increase I've tried to be more intentional about what I make, buying better materials, striving for a good fit, and giving each seam a thoughtful finish. I didn't mean to be quite so intentional as to take 6 months to finish! I have also been thinking of complete outfits when I'm fabric shopping, and using knit pieces to add texture and interest since I don't wear many prints. I now have a robust inventory of handmade clothing, and I don't need another single top that has no relationship with the rest of my closet. Those tops are helpful for honing skills, but not always helpful for getting dressed. The anchor for this look is the cardigan sweater. 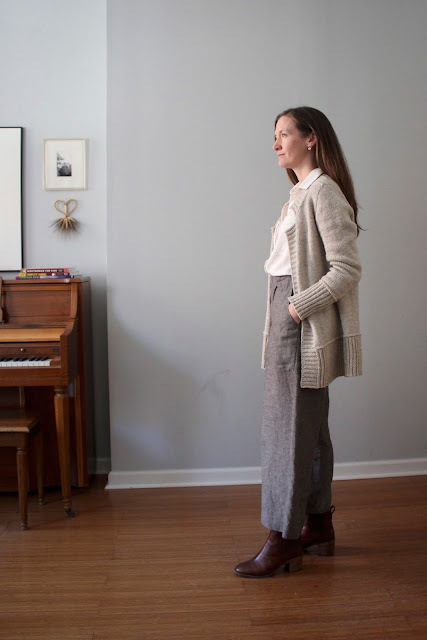 I have a medium weight RTW oatmeal cardigan that I have worn past the point of respectability. I still wear it around the house, but I needed something less shabby to takes it's place when in polite society. This is the much instagrammed Big Sister Cardigan. 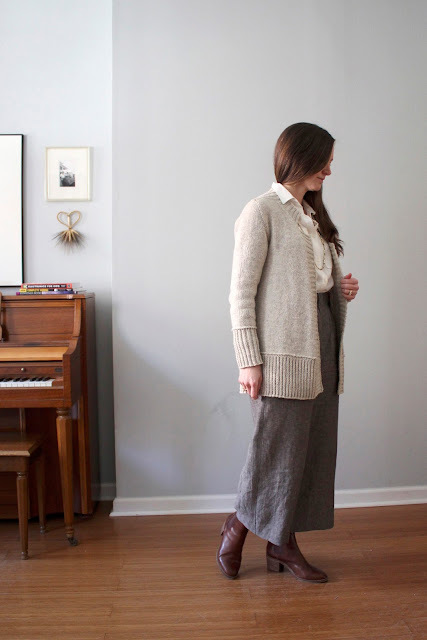 I like the construction of this cardi, it's knit as one piece. Even the ribbing at the hem and sleeve cuffs are worked with the body. The yarn is Quince & Co. Lark in Audouin. I really love the body and the natural hue of the yarn, but I don't love the gauge. The pattern calls for worsted, but a bulkier yarn would have served me better. I needed a US10 needle to get the gauge, making a much looser fabric than I like. It's a small thing, but makes the finished sweater a little less wearable than I had hoped. I already have a few swatches made for the Uniform Cardigan. If this sweater doesn't see much wear I will begin the yarn reincarnation process. No reason to let lovely yarn sit on the shelf. The Archer Button Up from Grainline Studio is a winter wardrobe hit. I really drug my feet finishing it because cold weather had set in and I didn't think I would wear such a whispy weight top. It really adds polish worn under a jacket or sweater, and has seen more action than most of my other Archers. The fabric is the long sold-out linen rayon from Blackbird Fabrics. It's tissue thin and has delicate drape. It is also quite sheer, a problem solved by wearing a sweater over, or a camisole under. The Telio Mozart Linen from Fabric.com (affiliate) looks like a good substitute. 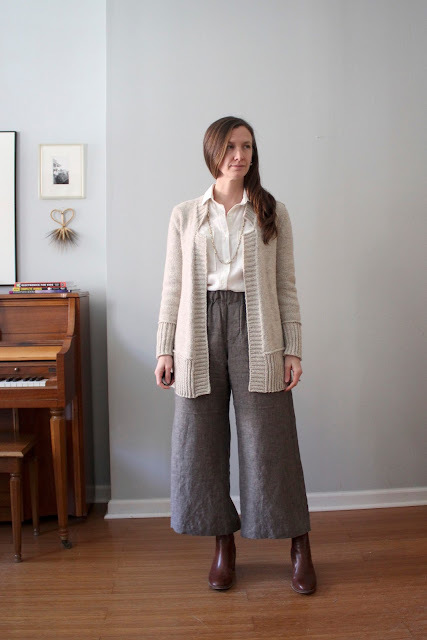 The pants are my now standard self-drafted wide leg pants, and I've already blogged about these. 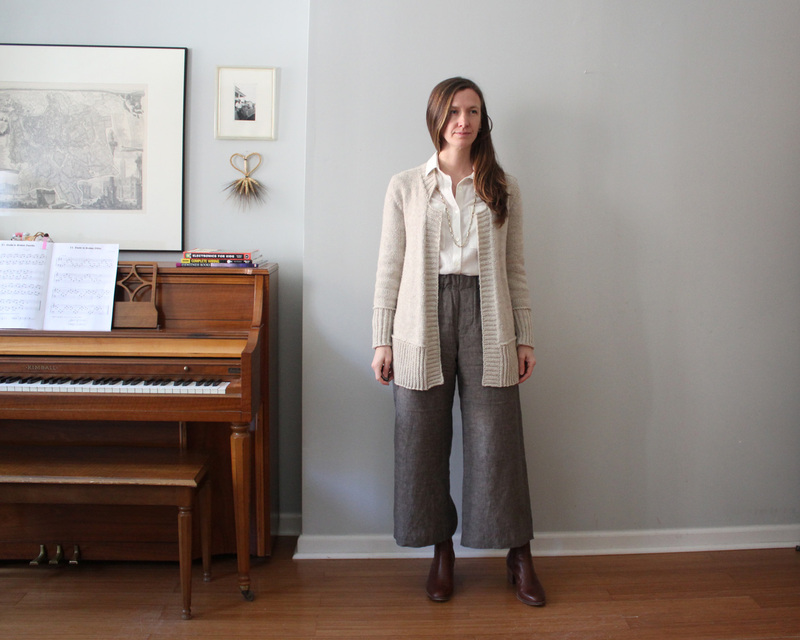 These are linen, which I wouldn't normally wear in the winter, but the roomy cut lets me wear thin leggings underneath. I feel like a classy grandpa in this outfit with the boots, high waters and cardigan sweater. If i had some hard candies in my pocket and bifocals on the chain around my neck the look would be complete. Classy grandpa or not, I've worn all of these garments a bunch since I finished them. You just can't go wrong with neutral basics. Sweater Yarn: Lark in Audouin from Quince & Co. This is such a sweet outfit! Three beautiful pieces that go together- what an accomplishment! And your fabric choices are divine. Thanks Claire! I love it when everything is handmade. This is so stylish and yet looks so very comfy. Stunning! Ha! It is pretty comfy. 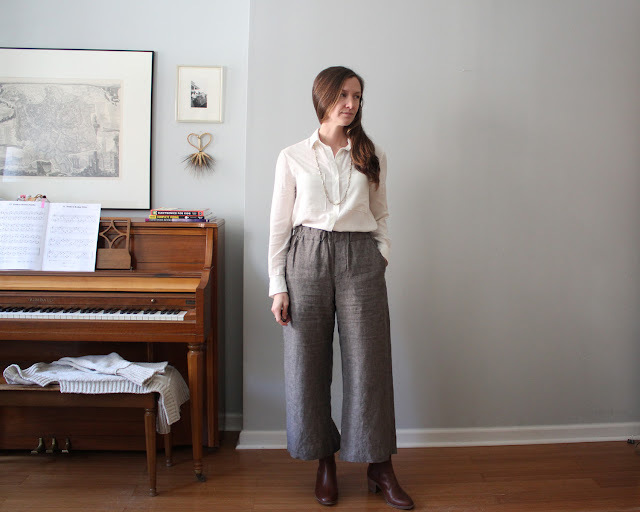 After years in skinny jeans these pants are a dream! What a stylish outfit! I love it. Gorgeous!! Love these garments together! Thanks! You can't go wrong with neutrals, so much mixing and matching with things I already own. Classy grandpa indeed! This outfit looks great. Oh you are nailing that polite society look! So classy and stylish, yet I suspect deceptively comfy too, right? !